So how was AFCC 2013? This year, I actually had an agenda in mind and a whole list of people to meet. I also needed to recce the venue because the Conference was being held at the National Library - an enormous building compared to the cosy colonial style Old Parliament House which served as the venue last year. The big news first: The Hedwig Annuar Book Award (HABA) went to Edmund Lim, author of Where's Grandma and Tan Zixi, illustrator. 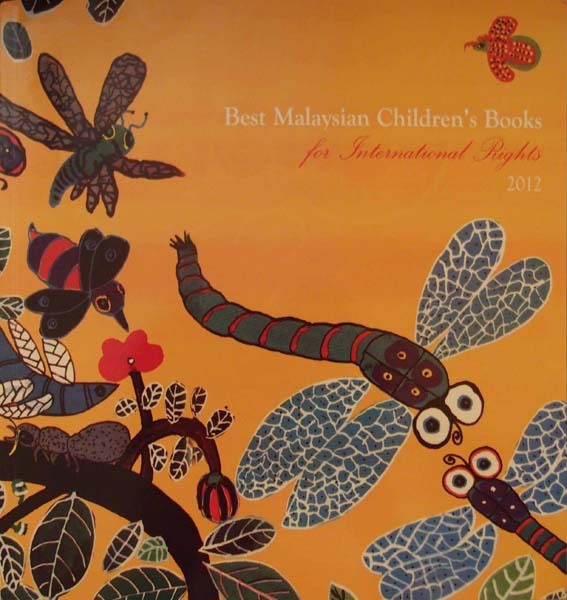 The SingTel Asian Picture Book Award (SAPBA) was awarded to two different books: Debra Chong, author of If I Were; and Baasansuren Bolormaa, illustrator of Old City. The talented Baasansuren Bolormaa is from Mongolia. I believe the AFCC is going to be the platform to discover new talent from all over Asia. The first talk I attended 'YA - A Malaysian Perspective' featured Teoh Choon Ean and Golda Mowe. Ean talked about the steps she followed to write a YA fiction in two weeks flat! Known as the 'uncrowned queen of short stories,' she admitted that she is also known as the 'lazy writer' because she only writes when there is a prize to be won! According to Ean, the important points to consider when writing Fiction are: Character, Plot, Setting, Theme and Style. In YA literature, style is subordinate to the story-telling i.e. when it comes to word smithing vs telling a good story, the latter always wins (a good case in point being the Twilight saga. However, the Hunger Game books have both style and great plot) So what goes into the YA novel? Fast-paced plotting; the plot is the story structure. The theme often focuses on the challenges of youth - the writer needs to be aware that a young adult is facing certain situations or events for the first time in his/her life. We also need to consider the inspiration for a story. Apparently, her observation that "teenagers live their lives as if they have the nine lives of a cat" led to her first YA novel. 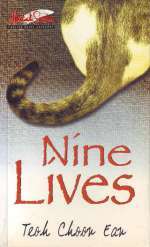 She wove nine separate short stories into a novel called Nine Lives using an umbrella concept which linked them. Being more comfortable with short stories myself, I find this idea could be put to good use. According to Ean, a survey in 2005 revealed that Malaysians above the age 10 read only two books a year, which was the same figure in 1995. Golda Mowe, the author of Iban Dream, talked about her struggles to write and publish her book - a process, we are told which took five years! One of the major obstacles she faced was her own mastery of the English language; she realised that ESL (English as a Second Language) was not enough and she needed to acquire First Language proficiency - which she did, undoubtedly. Iban Dream was finally published by Singapore-based Monsoon Books and she was the only Malaysian author to have a book launch at AFCC 2013. I admit to feeling slightly alarmed that her book was also based on legendary Sarawak and there seemed to be parallel plot lines to The Jugra Chronicles. But since I started reading it, I think they are completely different. Golda, being of Iban descent, herself has an insider's understanding of Iban culture. One of the fascinating thinga she mentioned in her talk is the papan turai. Apparently it is a storyboard (in the literal sense, made of wood), used to pass down knowledge, history, customs, myths and legend to the next generation. And reading her book is like being immersed in the legendary Sarawak of old, where gods and demons walk among men. Her writing style is quite intricate and literary; and she writes about tribal practices like animal sacrifices and head-hunting without flinching - as I said, she is fearless! 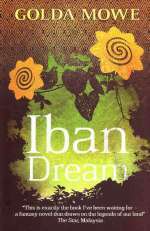 Although Iban Dream is being positioned as a YA novel, I feel it verges on full-fledged Adult Fiction. Talking about adult fiction, it appears that Malaysia is finally on the world literary map. Malaysian author, Tan Twan Eng not only garnered the Man Asian Literary award early this year for his book, The Garden of Evening Mists, he was also awarded the Walter Scott Prize for Historical Fiction, for the same book last week. While celebrating his success, Facebook friends felt that the book could have been better conceived - the setting in Japanese-occupied Malaya in WWII, was a bone of contention in particular. 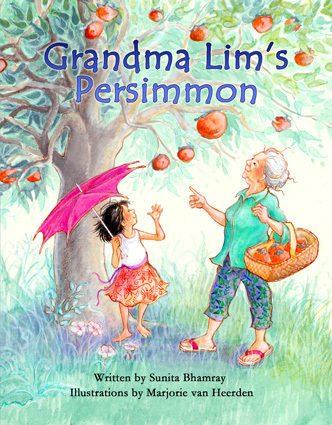 Grandma Lim's Persimmon is a Malaysian-published book which debuted at AFCC 2013. 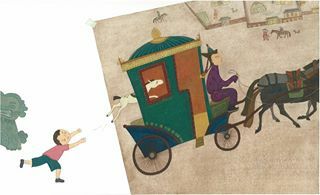 Authored by Singapore-based Sunita Bhamray and illustrated by South African Marjorie van Heerden, this charming picture book, published by Linda Tan Lingard's Oyez!Book represents a multi-national effort. Linda, who is also a literary agent as well as a publisher, talked about marketing and selling the rights to your book internationally during her session 'Marketing Your Books and Selling Rights - How a literary agent can help you. The highlight of AFCC 2013 was of course Malaysia Night, the inaugural Cultural night which celebrates the AFCC Country of focus. A group of students from Sekolah Seni Johor (Johor Art School), in bright colourful costumes, put up a dance drama based on Jainal Amambing's book, The Proud Butterfly and the Strange Tree. The guest of honour was HRH Raja Zarith Sofia, a noted children's book author and gifted illustrator herself. 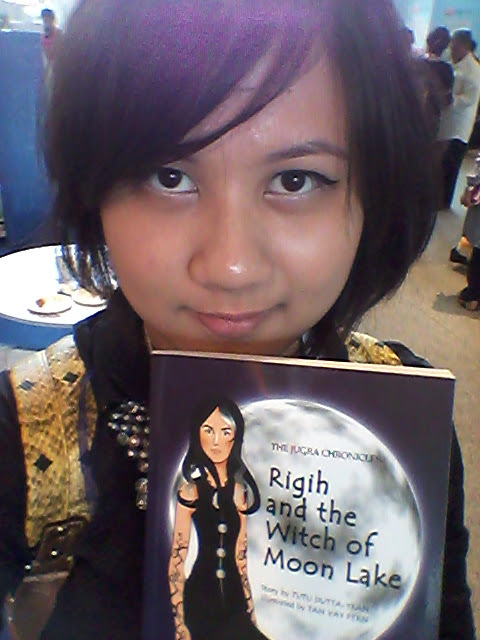 Emilia Yusof, the guest illustrator for AFCC 2012, presented her with an original painting of her story book character. 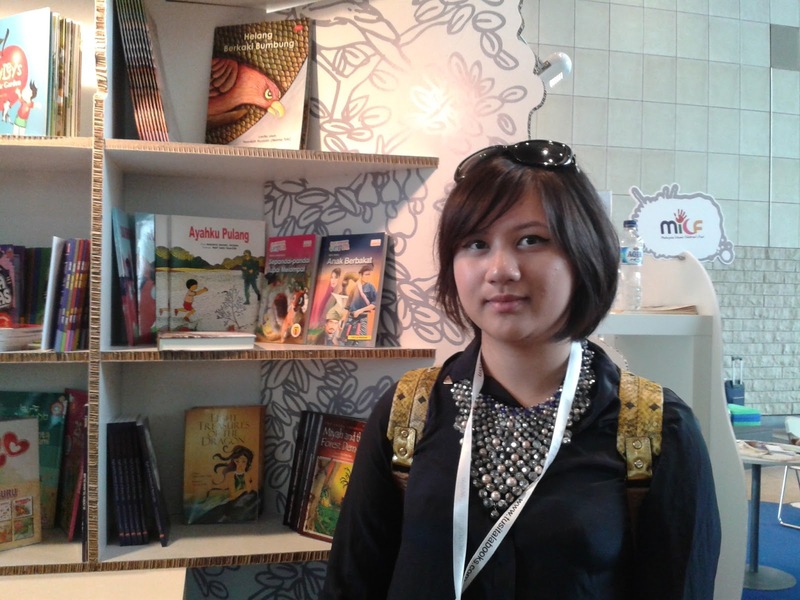 Emila Yusof was the guest illustrator for AFCC 2013. I managed to meet up with both Marjorie Coughlan and Corrine Robson from www.papertigers.org Surprising fact: even though Papertigers.org is based in San Francisco, Marjorie is British and lives in York, UK while Corrine is based in Vancouver, Canada. Apparently, there is an office in San Francisco which maintains the website (which is fantastic). Marjorie presented a paper on the fine art of reviewing children's books while Corrine is on the Project Splash! Asia committee. I had tried to get Eight Treasures of the Dragon included in the Project Splash! Asia anthology by Kenneth Quek, AFCC Festival informed me that it was too late as the booklet was already in print. What else? Renee Ting, President and Publisher of Shen's Books revealed that out of 2,000-odd children's titles published in the US, less than 100 are Asian themed. She divided the books into 10 categories: Non-fiction, Folklore, Historical Fiction/Memior, Big Issues, Focus on Culture, Immigration/Emigration, First Generation hyphenated American, Multi-Ethnic, Ethinicity/Culture as Setting and Ethnicity as Non-Issue. Using this system, The Jugra Chronicles will probably fall into the Historical Fiction + Culture as Setting. 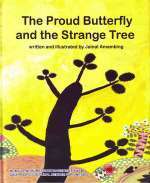 According to Renee, Asian themed children's books did not gain prominence until Grace Lin was awarded a Newbery Honour. She also mentioned that a successful book serves as a Mirror - where readers can relate to the characters or see themselves in it and/or serves as a Window - where readers look out into another world and see something new. I heard from Ean that Vatsala Kaul Banerjee's talk 'Child's Play - Editing Children's Book' was really good. Unfortunately, I was late (attending a story-telling session by Rosemarie Somaiah) and was turned away at the door - apparently the room was packed, with people sitting on the floor! Vatsala Banerjee is the Publishing Director at Hachette India. Maybe I'll get Ean to guest blog about it. I could not miss Yusof Gajah's talk about his life and his art. He was quite an engaging and amusing speaker. He is one of those lucky people who achieved success early in life - he recalled seeing a poster with his art on it in the subway station in Tokyo. Apparently he couldn't help himself and had to take one of the posters home! He also won the Nami Concours (held on Nami Island, South Korea) with his first ever submission and is now a judge on the Nami panel. Yusof Gajah encouraged other illustrators to participate in similar contests to make a name for themselves. Yusof Gajah also participated in the Illustrations Review session at AFCC 2013 with author/illustrator Naomi Kojima and Shirin Yim Bridges. Then the people I only get to meet once a year when we congregate for the AFCC - Linda Tan Lingard, Norhayati Razali, Daphne Lee, Salwah Shukor, Mohana Gill and Peter Duke. And old friends Gwen Smith and Tan Vay Fern were there too. I had a chat with fellow introvert, Salwah, about the difficulties of standing out in a crowd. I also asked her how she coped in a profession where one is expected to be quite forceful (she is a lawyer). She said she preferred negotiations to going to court... Salwah and her friend, Roshni Menon, have their own publishing company, SmallPrint, which was apparently set-up because they could not bear the pain of rejection, at this point in their lives! 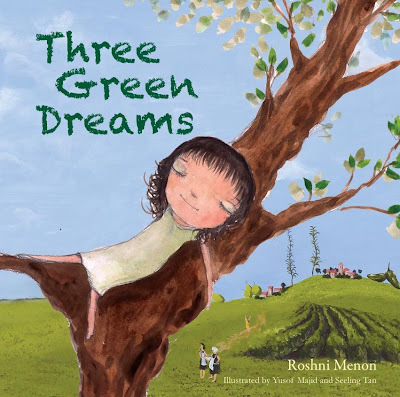 SmallPrint's first publication is a little gem called Three Green Dreams, by Roshni Menon. 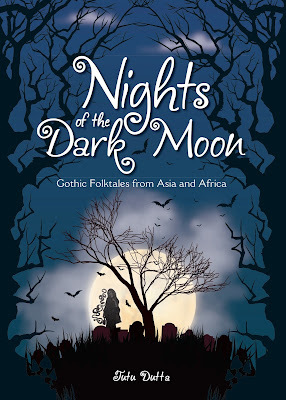 I also managed to chat with Daphne Lee, who mentioned that she is acquiring the rights for her books from MPH Publishing and plans to republish them. I asked her how she managed to accomplish this - she said she just had to ask them for it! 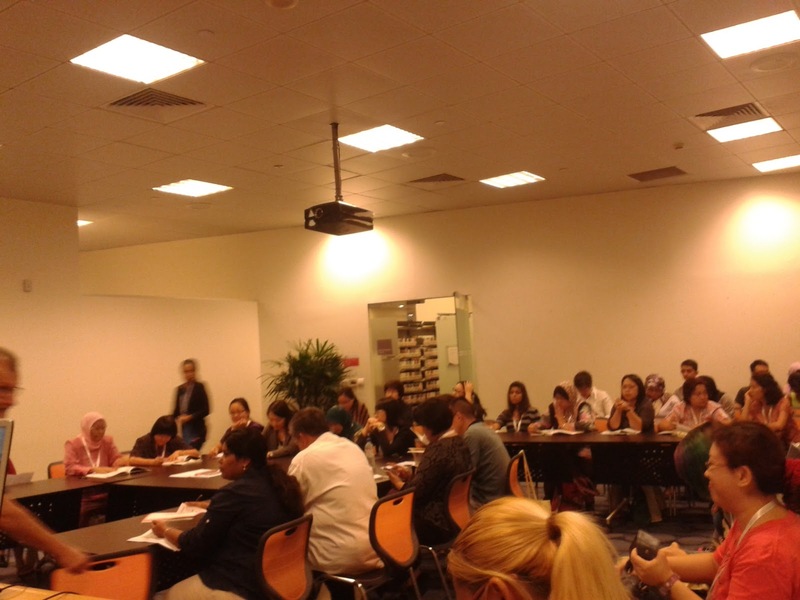 Daphne, Marjorie Coughlan and Anushka Ravishankar participated in a session entitled Asian Themes in Children's Books. So how did my talk go? Better than expected, considering my fear of public speaking. The attendance was better than expected too. Very grateful to Tan Sri Dr Asiah Abu Samah, the Chairman of Kota Buku; Norhayati Razali, Dr Gwen Smith, Teoh Choon Ean, Tan Vay Fern and Golda Mowe for the support! Many thanks to Kenneth Quek for printing out my paper - I tend to forget my facts, occasionally. The moderator for my session, Ken McKenzie asked a pertinent question. He said he always had to struggle on "whether it was right to change/re-tell folklore, which may be considered sacred to the people they originated from, to make them relevant to young people today?" I admitted that I went through a similar struggle when I first started re-telling folktales. Where the stories really what the original storyteller (panglipur lara in Malay) intended or something which I made up? But in the end, I had to do it of course. But I think Kamini Ramachandran had the right answer - she said that 'you honour the stories you right about." Absolutely, we honour the stories by keeping them interesting and alive for a new generation; otherwise they will just fade away. After my talk, I made a dash for the Women's Restroom. Came to a complete standstill when I entered the doorway and saw men ... I wondered, perplexed, "Why are all these MEN in the Women's Restroom?" A voice in my head said, "Duh, you're in the Men's Restroom!" I turned around and dashed out and made a beeline for the Women's Restroom next door! It was lovely meeting you at AFCC - I just hope that next time we get to sit down and chat for a bit longer! The whole conference went by in a flash. It was lovely meeting you too, Marjorie. Entirely my fault, really - too much running around!